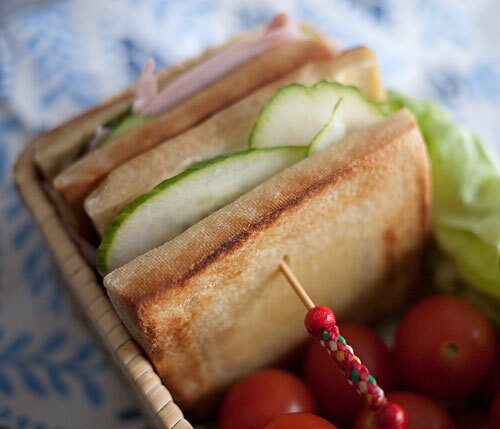 Here’s a bento featuring sandwiches made with kouya dofu or freeze-fried tofu sandwich ‘bread’ . 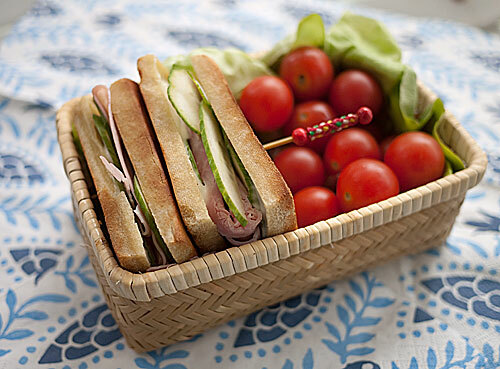 When you’re on a low-carb eating plan it’s really nice to be able to have a worry-free sandwich! The sandwiches were quite filling. As you can see they are not that low in calories, because I used a not-so-lean ham and real full-fat mayonnaise, but if you’re on a low-carb weight loss plan they should work well. I secured the sandwiches together with a long skewer so that they didn’t fall open. I filled the rest of the box very simply with cherry tomatoes, which were a nicely refreshing accompaniment to the sandwiches. That also kept the overall calorie count reasonable. I didn’t really eat the lettuce, but it serves as a pretty lining for the box. 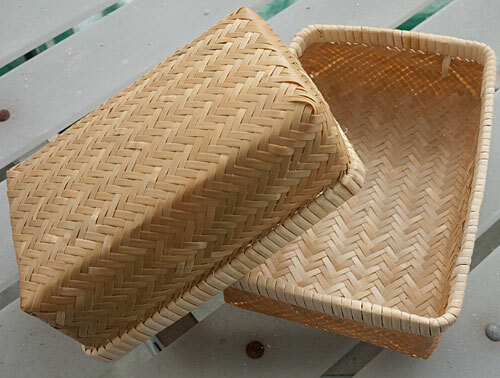 This is a woven bamboo basket box that I’ve had for years. It’s a traditional bento box type (see bamboo bento boxes ) and is good for sandwiches and onigiri, since it allows air to circulate around the rice or bread. It’s also very lightweight, making it ideal for bringing along on hikes. I did line the box with some kitchen parchment paper under the lettuce, to prevent any of the food from staining it.